I'm a wine drinker who happens to dislike beer. I have a buddy who's wired the other way around, and has me taste things when he's sure the sun rises and sets in whatever glass he's in love with at the time. "ah," I say, "this one smells a bit like crushed cherries, with an interesting smoky suggestion to the flavor." "see, you like this one then!" he'll exclaim. "nope," I'll reply, "beer still tastes pretty much like urine, but I understand why you like it. "this book is pretty much that same situation. 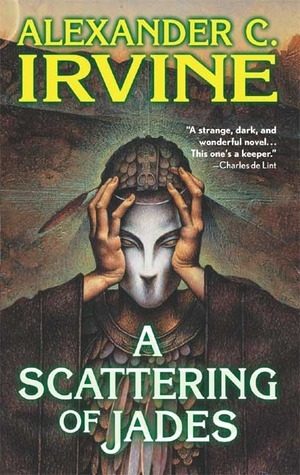 I'm well read enough to appreciate it on its technical merits, but I just don't have much love for irvine's debut novel. lovingly, lavishly researched, I longed for an annotated ebook edition just to keep up with the secondary names of avatars of priests of ancient aztec gods. these shifty-named personages work through a richly complicated scheme to bring about...well, some sort of vague new world order setup. we know why the good guy thinks it's a bad plan (ancient aztec gods = human sacrifice and all), but the bad guys are hell-bent on Getting Stuff Done though they have no concrete promises of tangible benefit on the other side. when dealing with creepy dead spirits roaming the earth and god-avatars that can render you instantly into gibbering madness, it might be a good idea to be a bit better prepared. dense, complex, richly detailed...and collapsing under it's own weight. What a great book! The beginning was a bit hard to follow at first, with various smaller characters disappearing and then reappearing later when you've forgotten who they are. But most of the book is a smooth ride. It has a plot that keeps you guessing and a main character (Archie) whom you can't help but root for during his quest to find his daughter while also being tempted and torn apart by two different ancient Mesoamerican gods. Irvine expertly handles the suspense of the story so much so that the last sixty pages which entail the denouement of the plot and Archie's dangerous travails in Kentucky caverns far below the earth are nail-bitingly exciting. Because of this I'm tempted to give it five stars, but after some consideration four is probably a more accurate rating for the book as a whole. Well worth the read, it's too bad this book is now out of print. It's definitely a keeper in my opinion. Bought this book years ago to read after enjoying some of Irvine's short works and reading the reviews and awards this book garnered. I found it difficult to get into, because many critical developments happen off screen; you suddenly encounter a character in a new unfamiliar place and then a few pages later are told what happened to get them there. This became less of an issue as the book went on, and I found the second half much more enjoyable. Irvine excels at writing scenes describing horrific or tragic occurrences. His weakness is in writing fully fleshed characters. Many felt the same to me in their manner of speech and thought. A lot of his avoidance of directly relating critical events in the novel may stem from his realization that he can't write a young girl well. What is great about this novel is the plot, and its entertainment in mixing fantasy with historical events and archaeology, almost in an Indiana Jones way. The plot centers around a man who is thrown in the middle of two sets of Native American deities: Aztec and Lenape. He is put into the position indirectly by virtue of the date of his daughter's birth, and the actions of a crazed, megalomaniac who seeks to follow through with the true, occult, plans behind Aaron Burr's treasonous plots. Taking place just before the American Civil War, the novel features appearances by PT Barnum and Edgar Allen Poe, a reanimated Aztec mummy in the service (moreso an avatar) of Tlaloc, zombies, circus folk (geeks), the Tammany Society, and Edgar Allen Poe. The majority takes place in New York City and Mammoth Cave, Kentucky.With all its oddities and earthly creepiness, the novel takes great pains to address the issue of slavery, using an educated slave as a significant (and perhaps only likable) character - much like the servant in Clarke's "Jonathan Strange & Mr. Norrell", and realizations by other characters on who poorly slaves and African American's are treated. Surprisingly, however, with its rich use of Native American culture and legend, there are few human Native American characters, and all things Amerindian are taken as malevolently magical, directly or indirectly. Interesting and unusual story, but I'm not sure if it would be to most people's liking. I have some mixed feelings about it myself. I picked it up years ago because it featured Mesoamerican mythology, caves, history and fantasy, all in one book. But sometimes that did prove to be a confusing mix and the spiritual side of the narrative was occasionally so arcane as to be impossible to follow (even knowing more about the mythos than the average reader). It was also darker than I had anticipated; the human sacrifices were not unexpected and I was prepared for those, but that, layered over the gritty reality of 19th century America plus a few arcane rituals thrown in for fun was occasionally more than I wanted to read about in detail. Overall I am glad I finally read it and I don't begrudge the time I spent doing so, but I doubt I will feel the need to do so again. As it stands, this is a story steeped in Mexican culture and religion with only one Mexican character (who dies early on, what a surprise). I wasn't motivated to like the main character or his daughter, and the antagonist was boring. The pacing was good, and the action was exciting, but I guess I was looking for something a little more emotionally and intellectually substantial. Honestly Stephen was my favourite part of the book and I was much more interested in him than the main plot. Good for reading on the train, but not much lasting power. The mashup of 1800s North America with Aztec and Lenape mythology is brilliant. I sorta wish this weren't the only book. Irvine has a didactic bent to his prose, and though it improves as the novel progresses it's admittedly a little hard to get through those first 65 pages. Still, once you do you have monstrous, mummified were-mages and spurned Aztec gods and dead men with vendettas and weird, bulbous grotesques. Who wouldn't be willing to do just a little bit of wading to get to that? The great New York Fire of 1935 starts the story of a little girl, a grieving man, a slave, Aztec Gods, and a Zombie. Possibly the greatest part of the story is the way it allows the reader to visit the magnificence and eeriness of Kentucky's Mammoth Cave. Not sure why, but I really enjoyed this book. Probably the nice world research and setting. As a caver, I really enjoyed the parts with Stephen Bishop in and around Mammoth Cave. It was a particular treat as I didn't even realize this was part of the story when I picked up the book. Mix equal parts of history and myth and you get a compelling brew. An amazingly original work, at least in my experience. Caused more outside research as well than any book in recent memory. An excellent tale, and many faceted. Alex Irvine - Alexander C. Irvine is an American fantasist and science fiction writer. Many of his works have appeared under the simple moniker "Alex Irvine." He first gained attention with his novel A Scattering of Jades and the stories that would form the collection Unintended Consequences. He has also published the Grail quest novel One King, One Soldier, and the World War II-era historical fantasy The Narrows.In addition to his original works, Irvine has published Have Robot, Will Travel, a novel set in Isaac Asimov's positronic robot milieu; and Batman: Inferno, about the DC Comics superhero.His academic background includes an M.A. in English from the University of Maine and a PhD from the University of Denver. He is an assistant professor of English at the University of Maine. He also worked for a time as a reporter at the Portland Phoenix.